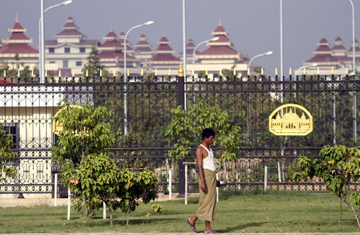 Was Burma's Opening of Parliament Significant? Deep in the heart of Burma's remote new capital Naypyidaw, a most unusual event occurred on the morning of January 31. More then 600 legislators gathered in a lavish, palace-like hall for the country's first parliamentary session in 22 years. Technically, nearly five decades of military rule in Burma had ended. But if the landmark gathering gave the illusion of a new political era in a country governed by the army since 1962, the reality was quite different. "New bottle, same wine," joked Win Tin, a veteran opposition politician whose popular National League for Democracy (NLD) has no seats in the new parliament because it boycotted last November's elections. "It's the same army men in charge. Everyone knows that convening a parliament and saying there is a transition to civilian rule is nonsense. We know where the real power lies." Indeed, although the military junta has boasted about setting Burma on a path to what it calls a discipline-flourishing democracy, the regulations governing the milestone legislative session showed just how isolated and repressive Burma's rulers still are. Foreign journalists were barred from attending the event. Parliamentary laws introduced in January restrict freedom of information. One rule, for instance, states that any non-MP who enters the parliament building without prior approval can be jailed for one year. Lawmakers themselves are not allowed to bring any electronic equipment, including cellphones, cameras or recording devices, into parliament. Nor can they even ask a question without going through an arcane process that takes more than a week. Even the oddly precise timing of the opening of parliament  8:55 a.m.  was widely seen as a move by the astrologically obsessed junta members to secure the most auspicious time to inaugurate their rubber-stamp body. At first glance, the past few months have brought what seem like major shifts in Burma's political topography. On Nov. 7, the country held its first elections in two decades, allowing an entire generation of young Burmese to vote for the first time. Six days after the polls, Nobel Peace Prize laureate and opposition leader Aung San Suu Kyi was released from more than seven years of house arrest. The NLD, which Suu Kyi founded, won a landslide in the country's last polls back in 1990, but the junta ignored the results and locked her up for most of the intervening two decades. But three months after these watersheds events of November, Burma feels essentially unchanged. Although Suu Kyi's NLD proudly inaugurated its website the same day that parliament held its first session, the party is no longer a legal political force. Many of the legislators now sitting in the improbably grand parliament building in Naypyidaw are hardly the people's choice. Due to likely voter intimidation and alleged ballot-box shenanigans, the junta-backed Union Solidarity and Development Party (USDP) won around 80% of the November vote. Its elected representatives in parliament include business cronies of the junta and officers who recently retired from the military in order to participate in what is officially supposed to be a civilian process. Those opposition parties that dared to participate in the polls, including a slew of ethnically based parties and the NLD breakaway National Democratic Force (NDF), won far fewer seats than international observers believe they should have. With one-quarter of parliamentary seats designated for military appointees, the opposition's power in parliament is paltry. Add to that the fact that top leadership positions are reserved for those with military backgrounds, and Win Tin's new bottle, same wine formulation makes perfect sense. One of parliament's first tasks over the coming days will be to select the country's new President. Speculation is rife as to whether current junta leader Than Shwe, an elderly former postal worker and Psy-Ops specialist, will want the position or whether he will prefer to keep the post of Burma's commander-in-chief. (By law one person cannot hold both titles.) An alternative candidate for President may be Thura Shwe Mann, a battle-hardened general famous for his loyalty to Than Shwe and for his brutal campaigns against ethnic Karen rebels. Either way, the President will not face much of a check from parliament, which for the most part cannot legally challenge him. Just a few days before the parliament convened, Burma's supreme court rejected an appeal by the NLD to have the political party recognized as a legal entity. Because the NLD decided to boycott the November polls, which it rightly believed would be neither free nor fair, the party was ordered dissolved by Burma's election commission in September. NLD elders have talked about retooling the party either as a shadow political engine or as a civil-society force. But both paths are untested. A political landscape with only a modicum of opposition presence in parliament and a totally absent NLD sounds like a bleak scenario for democratic progress in Burma. The lack of interest that many Burmese have shown in both the elections and the convening of the new parliament shows just how removed they believe their lives are from stage-managed Burmese politics. Around one-third of Burmese live under the poverty line; no parliament will change that in the near future. "Change in Burma will come through politics and also economics," says Kyaw Win, a Burmese political analyst in Rangoon, the country's largest city and former capital. "But we have to be patient." Sadly, that's the one quality the Burmese, who have witnessed the slow devolution of their homeland for nearly five decades, possess in large supply. See video of how renowned photographer Platon shot the Suu Kyi TIME cover.